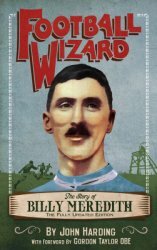 BILLY MEREDITH was one of football’s most extraordinary and controversial characters. Ninety years after his last match, his name is still one of soccer’s most famous. Born at Chirk, Denbighshire, in 1874, Meredith began work as a coal-miner when he was just twelve before his breathtaking soccer skills brought him to the notice of English clubs. Thereafter, he dominated the game for three decades. Winning top honours with the two Manchester clubs and a then record 48 Welsh caps, Meredith remains arguably the greatest player ever produced by that country. He was dubbed the ‘Wizard’ and even in his fiftieth year he was still making headlines by appearing in an FA Cup semi-final. But Meredith was also a rebel and a reformer and his career was dogged and disfigured by accusations of bribery and match-fixing. He was suspended for accepting illegal payments before leading a player’s walk-out during the struggle to establish a credible Players’ Union, (now the PFA) an organisation which he had resurrected almost single-handed. In this fully updated version of his ground-breaking biography, John Harding looks closely at this intriguing figure. 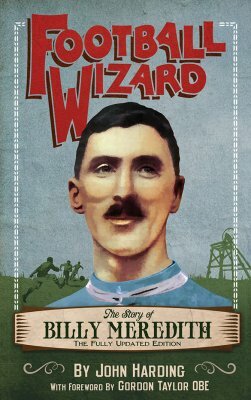 He examines Meredith’s attitude to the game and its rulers, appraises Meredith’s playing style and achievements and, with the aid of contemporary accounts, letters, photographs, and interviews tells the story of this complex, enigmatic, exasperatingly brilliant footballer—truly one of the game’s legendary figures. The publication of the original 1985 edition of 'Football Wizard' marked a landmark in sporting biography and has had many imitators. Now John revisits the subject in an era when English footballers has been transformed into global megastars beamed into homes worldwide. A world away perhaps from the grime of the Edwardian game but today's heroes will be grateful to Meredith and the early pioneers for their sacrifices. John Harding lives and works in North London and writes on a variety of topics, ranging from literary and sporting biography to cultural history and criticism. Past subjects include Arsenal star Alex James, boxer Jack 'Kid' Berg and poet and cartoonist Ralph Hodgson. He has written the offi cial history of the Professional Footballer's Association's, Behind the Glory, as well as a social history of professional players entitled Living To Play. He has also written for a variety of publications including The London Magazine, When Saturday Comes, FourFourTwo, Soccer Review and The Blizzard. His most recent book is Sweetly Sings Delaney, about Salford playwright Shelagh Delaney.